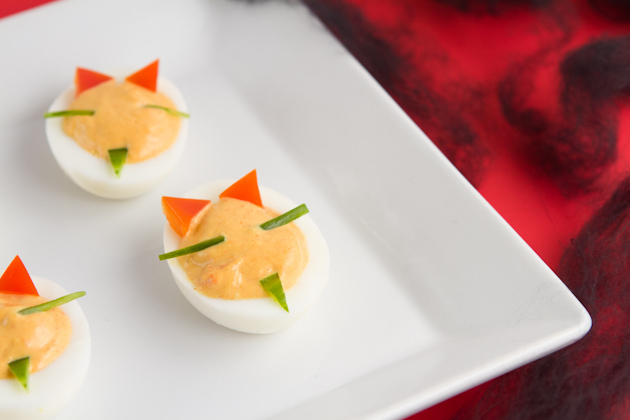 No healthy Halloween recipe collection would be complete without an appetizer, right? It was a toss up between bat wings, octopus, and witch fingers. 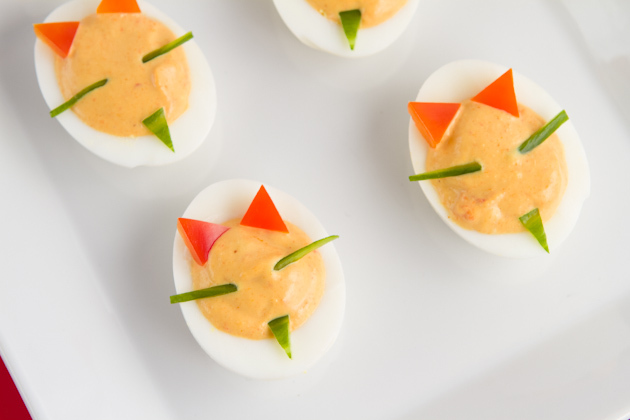 In the end, the idea of making evil deviled eggs won me over. I think I put the mustaches on the wrong way though. They should be pointed down not up and I just noticed it now as I sat here writing today’s post. They look more like cats, don’t they? Common’ be honest! Either way, cat’s are still Halloween-esque so we’re good. And there are red cats out there somewhere, I’m sure of it. 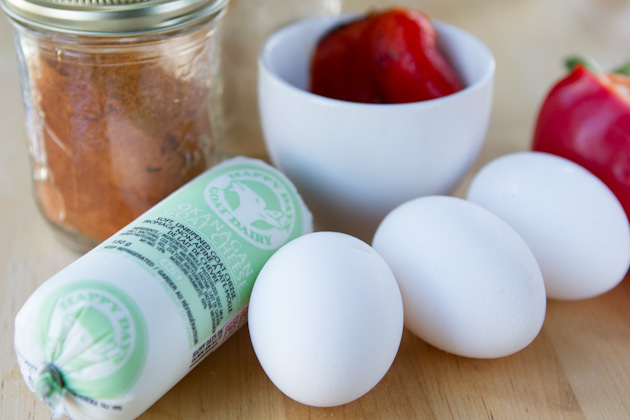 The original creator of the devilish egg was Martha Stewart. She’s a wise woman that one. Up until yesterday I’d never had a deviled egg because I was always wary of the ingredients. All that mayonnaise in one recipe cannot be good. With a bit of experimenting, I realized that Happy Days goat cheese acts as a great replacement for mayonnaise in just about any recipe and does wonders to the flavors of this healthy Halloween appetizer. Don’t worry, if you can’t have goat cheese I have you covered. This recipe was developed for Happy Days Goat Dairy. 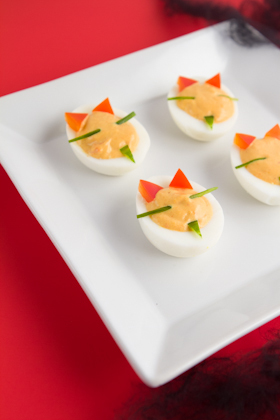 Devilish eggs filled with goat cheese, roasted red pepper and paprika. A simple (and a bit mischievous) Halloween snack! To hard boil the eggs, bring a medium-sized pot of water to a boil. Place one egg on the end of a spoon and gently place in the pot. Repeat until all eggs are swimming in the pot. Cook for 10 minutes. Make sure it's a gentle boil and not rapid. Once complete, remove from pot and place in ice water. Allow to sit for 5 minutes then crack on the counter and remove the shell. Meanwhile, preheat oven to a low broil setting. Place halved bell pepper on a cooking sheet cut-side down. Place in oven for 20-25 minutes or until top is charred. Remove from heat and allow to cool. Once cooled, remove skin. Slice hard boiled eggs lengthwise. Remove the yolk and place in the bowl of your food processor or blender. Process until smooth. Place egg white sections on a clean plate and fill with red pepper filling. Top with bell pepper triangles and cucumber skin pieces. Place in the fridge to cool for a couple of hours before serving. for a dairy-free version of this recipe,click here. You could use store-bought roasted red peppers if you wanted to, but roasting them at home is pretty darn simple. Just broil for 25 minutes or so, peel and you’re good to go. I wish I’d made more because they make a fabulous edition to salads. I learned that you have to be patient when scooping out the yolks from the egg whites. I broke a whole bunch of eggs and had to restart the processes more than once. I had ogre hands in the kitchen yesterday, obviously! and top with pieces of red pepper and cucumber. Now remember – put the mustache pieces on facing down, not up like whiskers! 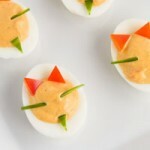 Now that I’ve been introduced to the world of deviled eggs I’m curious, what’s your favorite deviled egg recipe?